We have just received word that one of the games that we featured months ago as Indie games in the works will be making it way onto the marketplace as early as a month. Doom & Destiny has been finished and now the developers are going back to finish the tutorial for the touch controls and make a few tweaks. The only thing that might make this take longer is the fact that they are considering submitting the game as an Xbox Live game. Either way, Doom & Destiny should be arriving sooner rather than later. To read more about the game and see video/ images – check out the developer interview. 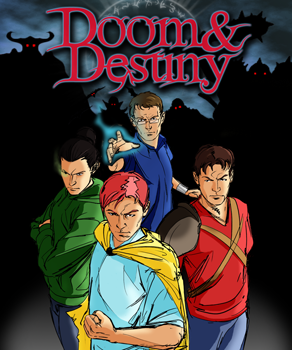 Doom & Destiny is a conventional Japanese style RPG with an unconventional mood. It tells the adventures of four nerdy friends trapped in a fantasy realm populated by clich, strange characters and weirder villains. Mistaken for heroes they will take a long journey through dangers and mysteries to reveal the evil plot of Unnamed and his shady lieutenant. Will our heroes be able to find their way home without losing themselves in laughs and bad jokes? Benjamin Ficus and HeartBit joined forces two years ago when they found out their common nerdish interest in developing indie games. While HeartBit focused on technical aspects of XNA programming, the Benjamin Ficus was creating a great game experience in his products. Written by: Hyde13 on February 2, 2012.